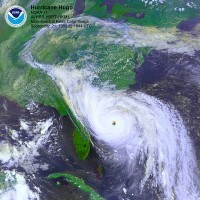 Could this Year Be the Northeast’s Hurricane Year? Bill Gray has been telling us since the Atlantic turned warm in 1995, that the Atlantic would be more active, with more storms, more intense storms and more landfalls on the U.S. mainland all the way from Brownsville to New England. The first areas to feel the brunt were the southeast coast and the Gulf and then in 2004 Florida. New York and New England has had simply to put up with heavy rain and locally damaging winds with storms that had come inland and weakened long before reaching the area. History tells us during the warm Atlantic, New York and New England is also more vulnerable to a direct hit. History also tells us this is more likely during La Nina summer. In fact in the 11 La Nina summers when the Atlantic was warm since the middle 1930s, there was at least one landfalling storm from the east coast of Florida to New England in every year with a total of 15 storms, 11 of them major CAT 3-5 storms. 9 of the storms affected the northeast directly or indirectly. It appears this summer will be a La Nina summer and the Atlantic is still solidly in its warm mode. This suggests New York and/or New England may be especially vulnerable this summer and fall (and if La Nina persists through this winter again in 2008). Indeed Bill Gray has put the probability of a landfalling major CAT 3-5 storm along the east coast from Florida to New England at 50% (average in the 20th century was 31%). The following is account of one such system, The_Great_Hurricane_of_38.pdf. For a more complete analysis of the threat and history of northeast storms, see East_Coast_Hurricanes.pdf. Of course a major landfall on the populated northeast would be blamed on global warming although major landfalls occurred in the cold early and late 1800s. He also notes “...how refreshing it was to hear Dr. Roy Spencer of the University of Alabama in Huntsville on the Rick and Bubba show earlier this week, who calmly presented the viewpoint that the warming in recent years is mostly natural. His facts and presentation were excellent, and all I can say is AMEN. And, by the way, I stand by the statement I wrote back in January. In a blog reported story last week, we reported on the disappointing decision to force students at Roger Williams University to watch An Inconvenient Truth to pass the Science core and graduate. In a contrasting example of the right approach, Mark Harper, Science reporter with the Daytona Beach news-journal online, reported that Embry-Riddle professor James Wanliss, a space physicist showed students both An Inconvenient Truth and The Great Global Warming Swindle in an honors course titled “The Politics and Science of Fear” because he said more and more the public is being sold one side of an issue with many dimensions. “I fear that attempts are being made to purposefully subvert the public understanding of the nature of science in order to achieve political goals,” he wrote in an e-mail. “Science is not about consensus, and to invoke this raises the hackles of scientists such as myself. The lure of politics and publicity is no doubt seductive, but it nevertheless amazes me that so many scientists have jumped on the bandwagon of consensus science, apparently forgetting or ignoring the sad history of consensus science.” John Olivero, professor and chairman of the department of physical science—allowed that skepticism is an essential tool of the scientific method. How Unusual is a May Named Tropical Storm? May or even April named tropical systems are actually not that uncommon, even when the Atlantic was cold as it was in the later 1960s and 1970s. The following shows the number of April/May (pre-offficial hurricane season) storms by decade from 1950s to the 2000s. Both the 1950s and 1970s had 3 early storms. We have had 2 so far this decade. Does an early tropical system foretell an active season? Again history says no, at least not by itelf. The average number of named storms that have occurred in years with an April or May storm since 1950 is 10.66, virtually the same as the average number for the season in all years during that period (1950-2006) of 10.72 storms. Actually more useful as a predictor is the warm Atlantic (positive Atlantic Multidecadal Oscillation) correlation that Bill Gray and Phil Klotzbach, Chris Landsea and those at the National Hurricane Center past (most recently Max Mayfield) and present adhere to. When the AMO is positive (the Atlantic is in its warm mode), the average since 1950 has been 12.81 storms. It is in the warm mode this season. Ironically Andrea’s formation brings to a close the longest period on record globally without a tropical cyclone. The last advisory issued on a tropical cyclone this year was at 06 GMT on April 6th, for Tropical Cyclone Cliff in the Southern Hemisphere. Wednesday’s 15 GMT advisory on Subtropical Storm Andrea ends the record longest period without a tropical cyclone at 33.4 days, besting the old record of 31.5 days set mid-April to mid-May in 1984. Reliable records of global tropical cyclone numbers go back to the beginning of the satellite era, about 1970. We hear in the news that many school systems around the country have made An inconvenient Truth required viewing for their students and in one system in California even the student’s parents. We know most students are being told in the classroom that the science is settled. This is true from the elementary to the college level. I have personally received e-mails from students at major universities seeking help finding more balanced information on climate change. They have told me their professors presented the science as indeed settled and no longer open for discussion, in more than one case calling skeptics shills for big oil or simply crackpots. This story by Randy Hall of Cybercast News Service “ RI Students Must Watch ‘Inconvenient Truth’ to Graduate” is especially telling. To receive a degree from Roger Williams University in Rhode Island, students are being forced to watch “An Inconvenient Truth,” the documentary on global warming produced by former Vice President Al Gore. After learning of the requirement, Dana Peloso, an RWU junior and president of the school’s chapter of the College Republicans, sent a letter questioning the course requirement to Jeffrey Hughes, assistant dean of marine and natural sciences. “With the issue of global warming being such a highly politicized topic, with the scientific community unsure if global warming is man-induced or part of the natural cycle of the earth, do you think that it is intellectually honest to only show the alarmist viewpoint?” Peloso asked. “If the movie is still shown, what plans are there to incorporate the ideas of leading global warming skeptics into class discussion?” he added. Assistant Dean Hughes replied “After an initial and heated debate, scientists no longer question whether the atmosphere is being warmed due to human activities and instead are increasingly impressed with the speed and impact of the process,” Hughes wrote. “I repeat: there is no doubt that we’re warming the earth and that a continuation of our activities will lead to profound changes.” “Penguins, polar bears and your unborn children have no vote in this. They must live with decisions we make today,” the assistant dean said. 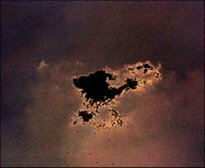 The area around clouds has given us trouble,” said study team member Lorraine Remer of NASA’s Goddard Space Flight Center in Greenbelt, Md. “The instruments detected something there, but it didn’t match our understanding of what a cloud or an aerosol looked like. What we think we’re seeing is a transitional zone where clouds are beginning to form or are dying away, and where humidity causes dry particles to absorb water and get bigger.” Scientists have been aware of an indistinct “halo” surrounding individual clouds, but the newly detected zone is much more extensive, taking up as much as 60 percent of the atmosphere previously labeled as cloud-free. The study was published in the April 18 issue of the journal Geophysical Research Letters. In the April 25th Icing the Hype story “Move Afoot to Block “The Great Global Warming Swindle “ DVD”, we reported about the effort of 37 UK scientists to block the sale of the DVD based on claimed inaccuracies and misrepresentations. See Stephen McIntyre’s Climate Audit blog where he shows that at least three of their major claims are not justifed nor wise. See Risk Management Solutions Ltd and the 37 Professors and RMS and Sulphate Emissions and Swindle and the Stick. 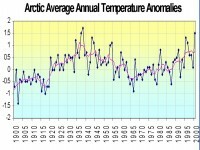 Image above shows Greenland Annual Temperatures since 1880 at Godthab Nuuk (top) vs the Atlantic Multicdecadal Oscillation (bottom). For full aize images see pdf. Dr William Gray has discussed the importance of the Atlantic Multidecadal Oscillation (AMO in both tropical storm activity and global warming. Dr James Hansen et al., 1998 wrote about the importance of the Pacific Decadal Oscillation (PDO) in persisting regional patterns of coolness in the southeastern United States and warmth in the west. In the following paper, I show how the oscillations in the two oceans affect temperature cycles and how irregular clustering of volcanic activity modulates the effects (enhancing or temporarily reversing). 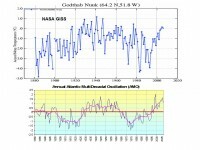 The numbers suggest the ocean multidecadal cycles are not given the respect they deserve in climate change. 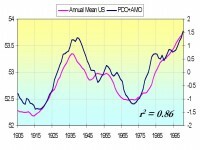 Image above shows PDO+AMO vs US HCN Annual Mean Temperatures. The Seattle Times reported last week “The snowpack in the Cascades, it was said, shrank by 50 percent in the last half-century. That statistic has been repeated in a government report, on environmental-advocacy web sites and in media coverage.... Seattle Mayor Greg Nickels recently mentioned it in a guest column in The Seattle Times....Here’s the problem. The number is dead wrong”. See how the debate caused the assistant state climatologist to be stripped of his title. See in the analysis below how the changes are cyclical and likely relate to the PDO and not global warming. See Northwest_Snow_Drought? Warming on Neptune’s moon Triton, Jupiter, Pluto and Mars coincident with earth’s recent warming suggest the only common forcing, our sun, may to blame. Note new paper also suggestive of correlations between the brightness of Neptune, solar variability, and Earth’s temperature Neptune Brightness Changes. Across the globe, millions of people have been transformed by the values expressed within various 12 step self-improvement or recovery from addiction programs. ICECAP finds some of those principles relevant to the efforts to understand global climate change. The climate change issue is highly polarized with scientists invested in one side of the issue or the other. How about a similar kind of program for climate scientists? On Icecap, our scientists are willing to take such a pledge. We encourage all climate scientists to join us. - Admit that science is powerless, for now, to completely understand the world around us, and thus conclude that we can, from lack of objectivity, make our work unmanageable and misguide mankind. - Make a fearless inventory of any immoral motivations that may be interfering with the scientific method. - Admit, when necessary, through this website and within all available media, our miscalculations. - Trust, nonetheless, that these mistakes are to be celebrated as part of the process of true understanding and for a greater good. - Humbly embrace all who will participate in the search for truth and never condemn or castigate those who differ with our conclusions. - Make a list of all concerns about which we may have been misguided, while honestly and with humility and respect, updating them with current insight. - Make direct and prompt contact with those that we may have inadvertently misguided, where possible and no further harm can occur. - Take continuing intellectual inventory, and when we are wrong, promptly admit it. - Through inner counsel and personal integrity, humbly submit to a methodology that allows for a true understanding of nature’s wonder. - Having trained ourselves to understand nature with sensitivity, reverence and rigorous scientific inquiry, encourage all of humanity to share in our wonder and respect for the world around us. Among the alternative to fossil fuels, tidal power is among the most promising and reliable for coastal areas where tides are large as in the northeastern United States and southeast Canada and in the Pacific Northwest.